If you're a gardener who loves scent, you'll flip for tuberose. 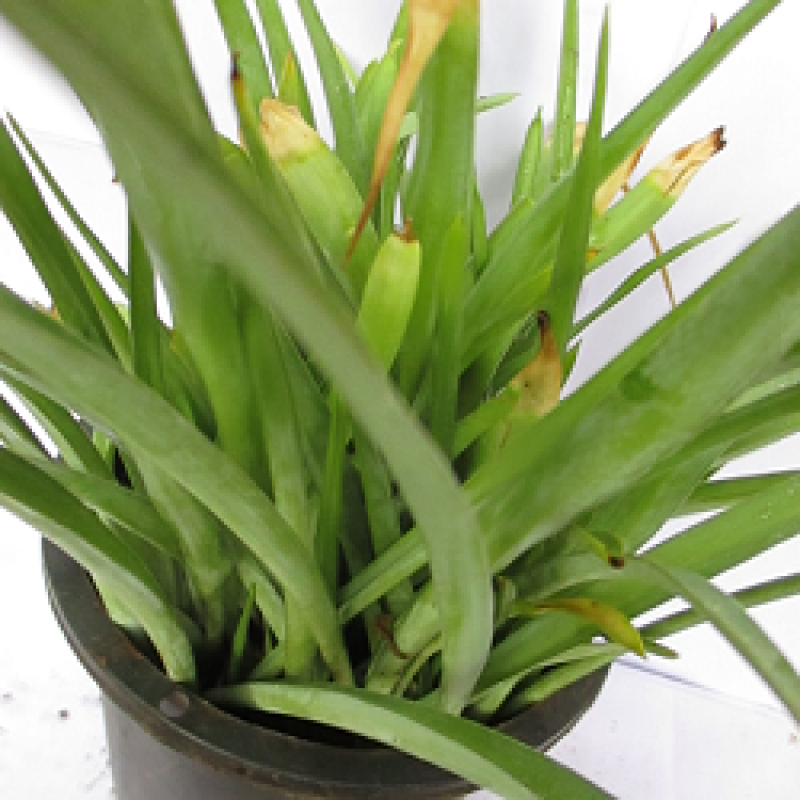 This bulb produces tall flower spikes with numerous tubular blooms and a fragrance that is rich, sultry and seductive. With Mexican origins it's not hard to understand how this plant is ideally suited to warm weather gardening, but northern gardeners with a warm sunny site can grow tuberose, too. Give your lots of tuberose sun, heat and time. You'll get back beautiful blooms with fragrance fit for the gods. Choose a location where the soil drains well. If there are still water puddles 5-6 hours after a hard rain, scout out another site. Or amend the soil with the addition of organic material to raise the level 2-3 inches to improve the drainage. Peat moss, compost, ground bark or decomposed manure all work well and are widely available. Tuberose will not thrive in waterlogged soil. Site your tuberose where they'll they'll receive full sun. In very sunny, hot areas light shade is also fine. 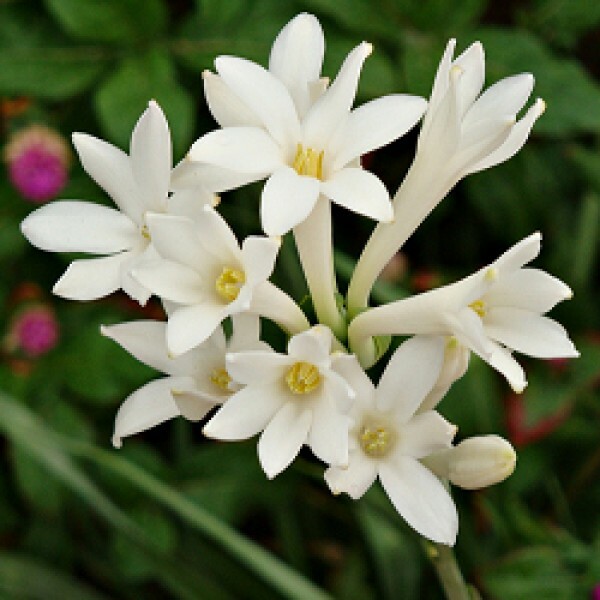 The tuberose bulbs we sell are actually nice clumps of multiple bulbs. Plant the entire clump with 2-3" of soil above the top. Place clumps 8-10" apart. After planting, water your tuberose generously to settle the soil around the bulbs. Roots and top growth will form within a few weeks. Water regularly during the growing season if rain does not occur regularly; 1-1.5" of total water per week is a good general rule of thumb. Tuberose plants are heavy feeders and appreciate applications of 8-8-8 fertilizer while they are actively growing. Water periodically during the growing season if rain does not occur, keeping in mind that weekly deep waterings are better than lighter drinks every day or two. Total water (rain and irrigation) of about 1" per week is a good general rule of thumb. Tuberose flower in mid to late summer, typically 90-120 days after planting. When in bloom, feel free to clip stems for bouquets. This will not hurt the plants and will provide a supply of extraordinarily fragrant flowers. Feel free to cut flower stems for summer bouquets. This won't hurt your plants and often helps keep them producing new flower spikes. Your tuberose will rest for a few months before beginning the next growing cycle. Fill your containers with good quality, well-drained soil. Almost any commercially available potting medium will work fine. Make sure there are adequate drainage holes; tuberose must not sit in waterlogged soil. After planting, water your tuberose generously to settle the soil around the bulbs. Roots and top growth will form within a few weeks. Water regularly during the growing season if rain does not occur regularly; 1-1.5" of total water per week is a good general rule of thumb. Tuberose plants are heavy feeders and appreciate periodic applications of 8-8-8 fertilizer while they are actively growing. Water regularly during the growing season if rain does not occur, keeping in mind that weekly deep waterings are better than lighter drinks every day or two. Total water (rain and irrigation) of about 1" per week is a good general rule of thumb. Your tuberose will rest for a few months before beginning the next growing cycle in the spring.